However, retaining control, following the socialization of the Web, is nothing more than pure legend. While many companies retain control during the stages of defining and shaping messages, control is relinquished at the point of distribution. Once messages are published, they are at the mercy of consumers, peers, and influencers online and offline. If a conversation takes place online and you’re not there to hear it, did it actually happen? Without participation, perception and sentiment are free to wander and influence those with whom it touches. The truth is that in the era of new media, we are all brand managers, responsible for its stature, resonance, and direction. While we may not retain control, we now have the ability to shape and steer impressions, answer questions, solve problems, and engender appreciation. And in the social web, brands are now expected to humanize and connect directly with everyday denizens to convey purpose, establish goodwill, and reassure communities that their voices are heard. It’s not enough to simply give the brand a voice. People align with the people, prowess, and promises they can believe in. We are now expected to breath life and personality into our brand in order for it to earn the attention and interest of those we wish to reach. Proactive shepherding the brand in influential communities begets positive interaction and in many cases, it extinguishes unforeseen crises before they ignite. It’s the art and science of sculpting presence. As such, many organizations are establishing a role or augmenting existing responsibilities to encompass ORM (online reputation management). As Forbes recently alluded, perhaps it’s time for a Chief Reputation Officer. 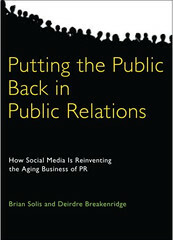 Econsultancy and BigMouthMedia published a report, Social Media and Online PR, to assist marketers embrace ORM. The report is based on a survey of more than 1,100 companies carried out in September 2009. Respondents include client-side digital marketers and communications professionals, as well as digital and PR agencies. There are two stats that caught my attention in particular. First, over one-third, 35%, reported that they do not embrace any of the afore mentioned response strategies to steer negative towards neutral or positive. Second, another one-third of respondents vowed to improve products and services in order to invest in positive experiences and more effectively compete for the future. Not surprising however, most of the other tactics were aimed at either distracting people or burying content. I once asked whether Twitter was a broadcast or conversation channel or both? According to these numbers, they appear to portray Twitter as yet another broadcast mechanism similar to the wire services that catapulted press releases into a vastness of irrelevance. We earn the relationships and define the dedicated communities and ultimately the authority and trust we deserve. It’s encouraging, however, to see that almost half of those who participated in the survey monitor the state of their brands on Twitter. While low, 27% is a very promising representation of what will only grow in 2010, the integration of rapid response systems to issues and inquiries. Combined with the 25% currently focused on gathering customer feedback and 23% to garner market intelligence, brands will evolve and adapt from the inside out, creating more empathetic and in tune organizations that live and breathe based on the health of and emerging opportunities within their markets. Also, please be sure to embrace a proactive form of brand asset management, securing company, product, and service brand names as well as important executives responsible for steering and growing the company. Services such as Knowem.com (disclosure, I advise them on services) facilitate automated username and profile acquisition and establishment across hundreds of existing social networks as well as ensuring brands are actively protected with every new network that appears. Interesting post given that I blogged a piece today about my irritation at one of the UK’s social media guru’s inability to engage with me properly on Twitter! I’m just waiting to see if she gets back in touch. What concerns me (here) is your comment that Twitter is falling into a broadcast channel instead of a discussion or space to dialogue. If business users in particular carry on in this fashion consumers will switch off, avoiding yet another channel of pushed advertising. Interesting way to think about it…but indeed, over time, they can not only shape perception through participation, but learn from it, thus becoming a more in-tune organization that shapes perception through change. Jeff, I think it's more about the philosophy of accepting that there will always be people with negative sentiment towards your brand. I don't think you should be trying to overwhelm as much as you should be trying to have a platform and voice to respond against it. This is, after all, a time when journalists feel their livelihood is under siege from the Internet. I think the myth of which you speak extends further back than just the social web. Control was always an illusion. Indeed. That really is the essence of the post. Social Media didn't invent conversations, yet, in some circles, I think many believe it did! Your grandmother's words are very wise. United does break guitars, and Domino’s pizza crust does taste and feel like cardboard. Can’t go back and make it not so. I would argue though, that a measure of control is exactly what new media offers. My own sentiment towards these and many other brand’s services or product come from the new media conversations that center around that brand’s meeting with negative sentiment head-on. Is this not a pro-active exercise in control? I love highlighting these conversations when talking to a company about social media participation. It may still be only an illusion, but this illusion and a desire to steer these types of interactions resonates with the majority of those that I speak with. One thing that I've noticed in my community building is that when the community is strong, it will stand up for you. A community of mine that I've built in particular seems to have created its own zero tolerance policy for negative feedback. Most any time there is a negative comment, almost instantly there are at least 5-10 people who jump in and avert some of the pressure. As manager of the community, I respond as quickly as possible, mostly in real time, but sometimes that just isn't possible. It's always nice to have that sort of support from the community. In some cases the negative feedback has been turned around before I've even gotten the chance to respond on behalf of the brand. Knowing this from the onset, I find it easier talking to brands that are hesitant to jump in. Tommy, it is a metric for the strength and stature of the community – it's willingness to speak on your behalf. In many ways, it is representative of how social can scale without adding overhead on staff. Tommy I don't necessarily agree. If there is a place where “newbies' are made to feel unwelcome and that simply stating a differing opinion or trying to discuss a negative opinion of something is going to make a community jump down that person's throat, they won't be back. Everyone in large corporations should know this statistic by heart – for every 1 (legit) complaint, there are 9 others who won't bother to tell you – but they won't be back and they may bad mouth to their friends. Astounding. It seems that 67% of brands (by my count the percentages displayed in the “Minimize the impact of negative comments) fail, to some degree, to leverage social media in it's most valuable role. Identifying issues and moving to directly address them. Some say that loyalty resulting from negative comments that have been successfully addressed can be more valuable and deeper than the loyalty of those who are always positive. Intelligently and openly addressing negative sentiment provides companies with a rare opportunity to show themselves as concerned, engaged and responsive to individual consumers needs. Dmattcarter, I think thats a good point. And building on that, one could see engagement in either a positive or negative form as a success from a brand standpoint, as long as you have the mentality, tools, and resources to offer every opportunity to shape it. It takes a lot for anyone to engage with a brand, they have to be truly motivated, so as long as you are listening and willing to offer support, acknowledgment, and respect there is a lot to win, even from negative feedback. Brian, don't you think this is mostly relevant for large companies though? I see tons and tons of small companies who have a FB fan page (and I think users are getting very weary of fan pages in general) with just a handful of followers, they tweet, but overall aren't their efforts and resources, which are limited, better off just improving customer service to begin with? This seems more relevant to Comcast, AT&T, big companies in that league. Agreed, but also needs to be kept in mind that small businesses have limited resources. They cannot afford to hire a “Chief Reputation Officer” or someone dedicated to online social networking. I see a lot who are online all the time, begging the question when do they get any work done? While companies seem to adopt Twitter as a broadcast channel, some other studies indicate that Twitter seems to be employed by consumers and professionals as more of a conversation channel (with some link broadcasting). Broadcast alone tends to be more intrusive, which might be why moms prefer to follow companies on Facebook where those various groups and fan pages are a bit more in the background. Good stuff to consider. To be honest, I was surprised by your stats that only 62% of brands use Twitter to publicize new content, and 54% as a marketing channel. I'd suspected that broadcast-to-participation would have followed something more akin to the old 90-9-1 rule. It's inspiring to note that more than a quarter of Twitter usage by companies is for customer service. I mean it is a perfect customer service framework, after all. Interesting ideas. As we get better (collectively) at using the social web, I think more of us (companies and individuals) will find we do have more control over our message. But the key parts are about being engaged, establishing trust and having a human face. Interesting post Brian. Understanding the difference between control and influence is a good starting point for executives or managers fearful of sparking negative conversations about their brands. As you say, the conversations will happen regardless, so it's a choice between making positive (and influential) contributions based on objectives or ignoring and hoping the conversation will evaporate. My grandma wasn't as sharp of tongue as DJ Capobianco's but she did tell me that ignoring a small problem now can make it a big problem later. Nowhere is this more true than with online reputation managemnent. Except I went to Knowem and found that you are a business advisor. Am I just so new to your blog that I didn't know this previously? Shouldn't you have a disclaimer in your post? When I did get to Knowem, the site trumpets coverage in The Wall Street Journal and The Washington Post, among others. Why can't I click on those links or go directly to the story? Is it that the story wasn't that great? If you're going to talk about building trust through social networks, maybe you should start by looking at your own work. Hi Laurie, it's a good question. Perhaps they're listening. As for disclosure…You're right. I'm usually pretty good about disclosure 🙂 – I do offer them advice on how to improve their services so that the brands I with can simplify the process of securing their brand assets on the social web.